The Philippine Retailers Association – recognized as the “pulse and voice of the retail industry” ensures that the interests of the members of the retail sector are strongly represented. As such, the PRA has been the forefront of the many issues confronting the industry such as coin shortage, standardization of garment and shoe sizes, sidewalk vending, senior citizens act, music copyright issue, contractualization, price tag law, liberalization of the retail trade among others. Through this representation, issues and concerns of the retail industry are heard and brought to the attention of relevant government and private agencies for discussion and/or resolution. The PRA has established programs and projects to help retailers grow their businesses and expand their operations. Each program is aligned to address the request of various retail owners engage in the step. Retail Excellence Seminars – In partnership with relevant Associate members and trainors, the PRA conducts seminars on customer service, merchandise buying, shopper insighting, retail marketing, e-commerce, digital and mobile marketing, etc. Lakbay-turo para sa micro-tourism enterprise program – A joint project of PRA and Department of Tourism (DOT) to help upgrade the skills and competencies of micro retailers in the tourism industry (specifically souvenir shops in major tourist areas in the country). Regional Roadshow – This project helps provincial retailers become more up-to-date on trends and best practices to help their business grow. Retail Career Expos – a 2-day career expo which seeks to generate a continuous source of qualified candidates for various levels and positions in the retail business. Since its inception in 2006, the PRA have conducted Job Fair expos in various malls, including Glorietta, TriNoma, Robinsons Place Manila, Robinsons Galleria, SM Megamall among others. Retail Executive Circle (RetailRex) – A high level, exclusive, by invitation only breakfast meeting of retail owners and top executives from the retail industry to hear about the ground-breaking developments in the retail arena. National Retail Conference and Stores Asia Expo – It is the centerpiece of PRA’s programs which serves as a top-level venue for networking as well as learning new trends and developments in the retail industry. International Study Tours – The PRA organized an international study tours for retailers to expose them to the global retail market, learn interesting retail best practices, identify the latest global trends and open opportunities for business partnership with various businessmen and companies. Teresita Sy-Coson of SM Retail Inc.
Mr. Lucio Co of Puregold Priceclub, Inc.
PRA members have an access to the PRA library with a databank of reading materials, books, magazines and references including the quarterly “Philippine Retailing” newsletter which is the official publication of the organization and serves as a conduit of information on the latest news and developments in the industry and the activities of the association. The PRA also regularly issues circulars on industry updates (laws, regulations, ordinances, etc.) affecting the retail industry, in particular, and business in general. 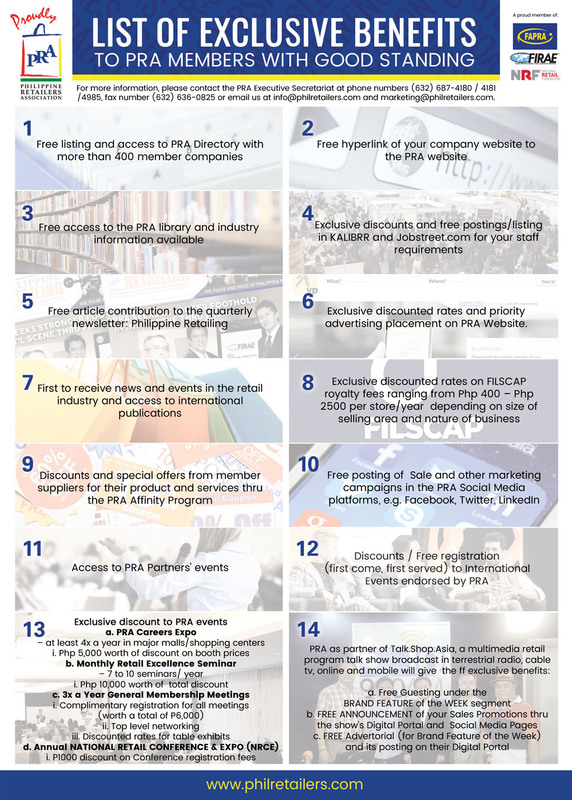 Aside from its dynamic composition of key players in the retail industry – retailers, wholesalers, distributors, suppliers, manufacturers – the PRA is also affiliated with other large influential business organizations locally like the Philippine Chamber of Commerce and Industry (PCCI) and the Employers’ Confederation of the Philippines (ECOP).Additionally, the organization is a proud member of international associations like the Federation of Asia-Pacific Retailers Association (FAPRA) which is composed of 18-member economies, the Federation of International Retail Association Executives/National Retail Federation (FIRAE/NRF), the world’s largest retail organization based in the U.S.These National and international affiliates provide local retailers the unlimited benefits of being connected to the global world of business and retailing.